Retaining walls are a functional, attractive solution to unstable and sloped terrains. They are used to hold back hillsides and help prevent soil erosion and landslides. Retaining walls, also create more useful area for everything from patios, paths, and driveways, to roads, parking lots, or any construction that requires a flat surface. Dean’s Landscaping offers a variety of products to fit your residential or commercial needs. Whether it is a small seat wall with columns or fire pit up to a large engineered load bearing retaining wall. We offer a wide variety of products including natural split stone, manufactured concrete (SRW) blocks, boulders and concrete cinder block with stone veneer walls. To achieve a quality and long lasting wall project, proper installation techniques must be completed. The first step is excavation of existing soil, to proper depth within the wall base area. The next step is installation and compaction of the gravel base. Proper base depth and compaction is one of keys to a successful wall project. The next step is installation of wall block, along with proper drainage behind the wall. Depending on the wall height and load the wall is retaining, installation of geogrid is a critical key to the long-term success of the wall. Dean’s Landscaping employs NCMA certified retaining wall installers to ensure the very best quality from start to finish for your project. Dean’s Landscaping has the knowledge and experience to design and install your project properly to last many years through the freeze and thaw cycles in the Miami Valley area. 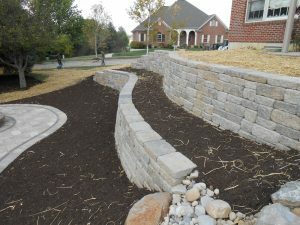 Let’s get started on your retaining wall project.